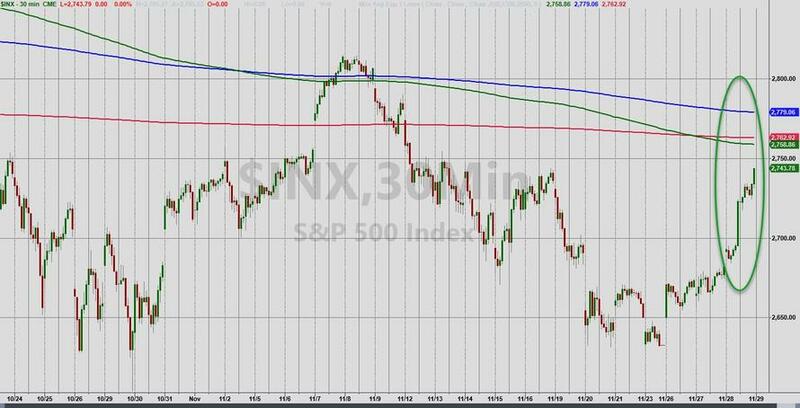 Was Yesterday's Rally The 'All Clear' Signal Or More Noise? The equity markets no doubt experienced a powerful move yesterday on the back of Fed Chair Powell’s dovish remarks mid-day. Specifically, his comments laid the groundwork for a pause in interest rate hikes in the first quarter of 2018. It was a welcome development for an equity market that has failed to find direction all year, partly on concerns of the Fed over-tightening policy. The net result: US stocks up 2+%, the US dollar down .5%, gold up .5%, and mild compression across the interest rate curve. The question now becomes, is this the type of market action that will take us to new all-time highs and beyond: a Santa Claus sponsored market? Or was this noise in an otherwise messy market environment in which investors still need to contend with the US-China trade standoff, Brexit, and slowing US and global growth? For the reasons we highlight below and more, we think the latter. First, breadth, even on a big up day like today, was lacking compared to other lows seen back in 2015 and 2016. The number of advancing stocks divided by declining stocks on the NYSE came in at 6.9 today, a respectable number, but not a number that signals the type of buying panic indicative of a major low. Back in 2015-2016 the NYSE advance/decline ratio approached 15 on several occasions, which was the setup for the two year run ended January 2018. Another breadth indicator that still lacks thrust is the percent of stocks making new highs. 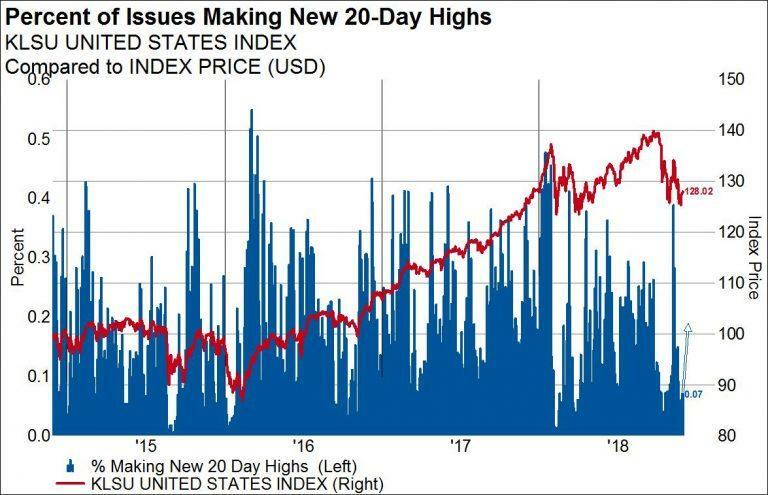 Today only 16% of S&P 500 stocks traded to a new 20-day high (the location of the arrow in the chart below), a rather paltry number even compared to earlier in the year. Following the low in 2016 more than 50% of stocks traded to a new 20-day high. Furthermore, credit didn’t buy the rally today. Despite stocks rallying 2+%, high yield spreads only came in 6bps. Since October they are wider by more than 100bps. We would like to see credit spreads narrow considerably with stocks moving higher. 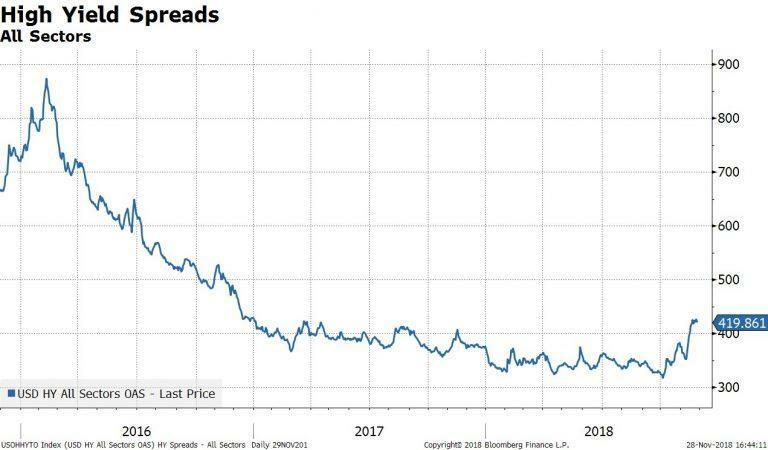 US investment grade credit default swap rates did retreat a little today, but in the context of a widening. There is more work to do on the credit front. All this begs the question of whether today marked a Fed policy change that will kick off a Santa Claus rally or whether we are simply rallying back into resistance before the directionless trend continues. We suspect the outcome of major international events this week – US/China trade talks and Brexit – will be the tell more so than the Fed’s somewhat anticipated dovish policy turn.